The Partagas Serie D No.5 is a powerful yet creamy medium-full Petit Robusto, 4.3” (110mm) long, of 50 ring gauge, and comes in a box of 25 cigars. First released as a Limited Edition in 2008 and due to its immense success and popularity as an Edicion Limitada, it was later also released as a regular production cigar. 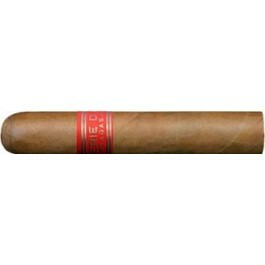 All the flavors of a Partagas Serie D No.4 are condensed in this smaller vitola, 110mm x 50 ring gauge, which makes it a go-to cigar for the Partagas Serie D No.4 lovers who are looking for a quick smoke and still enjoy all its taste. Well balanced and delicious! Creamy cedar and wood with a sweetness whipping in and out. Full of billowing, thick smoke you want to savor puff, after puff. Excellent construction. Even burn and draw has nice resistance. Although shorter than the D4, burn time is close. 60-75 minutes. This Partagas D No.5 is one of my favorite short smokes packed with flavor and very smooth just the right size. Cigar Terminal always gives Five Star service! A short version of the D4, medium to full body, rich taste. Excellent cigar! Lots of aging potential. Robustos are my favorite size and the D4 and smaller brother D5 may just be at the top of the heap. Generally prefer mild/medium cigars, but Partagas is the one fuller bodied smoke I really enjoy. This vitola is superb all round and is highly recommended.